EastSouthWestNorth: What Did The Bishop Say? That depends on which newspaper you read. So which one did you read? (The Standard) Zen spars with Ho over role in march. Carrie Chan. November 26, 2005. Zen told 300 followers at a gathering at St Francis Church Friday that he has not breached the rules of the church. "There are reports that I have taken the lead in encouraging people to attend the rally. I have not encouraged followers to march but it is their right to do so in the pursuit of full democracy." (Sing Tao) Joseph Zen Suddenly Changes His Word on the March. November 26, 2005. It was rumored recently that Catholic bishop Joseph Zen caused unhappiness at the Vatican with his high-profile opposition against the political reform package. Yesterday, when Zen met with church members, he was questioned by some members and that led to some tense moments. Zen clarified his position several times and said that he had not pressured church members, but he only "encouraged" (鼓勵) those members who want universal suffrage to march. Although he made many different interpretations at the meeting, the flyer distributed by the Hong Kong Catholic Diocese emphasized that the media created misunderstanding in reporting his role in opposing the political reform. "According to Catholic doctrine, the bishop will not instruct the church members to engage any form of political action." Bishop Joseph Zen of the Hong Kong Catholic Diocese met the believers last night about the political reform. But the participants clearly held divergent views. Some vigorously questioned the bishop while others supported him strongly. At the meeting, a page titled "Bishop Joseph Zen discusses political reform with church members" was distributed to the attendees. This notice clarified his previous comments and showed that there was some softening and distancing away from the protest march. It included the emphasis that church doctrine does not allow the instruction to church members to take political actions, and Joseph Zen is only encouraging "citizens" who long for universal suffrage and want political reform to progress faster to march. It also clarifies that Joseph Zen did not call for a previous meeting to oppose political reform. In discussing the political reform package with the church members, Joseph Zen clarified several times that it was a "total misunderstanding" for the media to report him as "corralling votes" among the democrats and that he is instructing church members to march early next month. Joseph Zen explained that on November 4, he wanted to discuss the political reform package with several other religious organizations, but some legislators wanted to join in too. He said that someone wanted to apply pressure on the legislators. He said that he "did not want to use this method," and there was absolute "no instance in which pressure was applied." He guaranteed that a bishop will never play the role of leader in opposing political reform, or pressure church members in a "high-handed" way to get them to march. Joseph Zen said, "If you are anxious (about universal suffrage), you can march; if you are not anxious, you don't march then." He said that this is the critical moment, so if "you don't come out, other people will think that you don't care." Although the three points of clarification released yesterday indicated a cooling down of the anti-reform stance, Joseph Zen did not back up yesterday against those who were dissatisfied with his call for church members to march. He reiterated his previous statements and said that citizens don't have to march, but it is no crime to be anxious and the public does not have to use "oppose" to describe their actions. Concerning a church members asking "Which part of the Bible mentioned protest marches?" Bishop Zen only replied that the words "universal suffrage" cannot be found in the Bible, but the Pope has lectured them participation in public affairs. He also quoted from the Book of Wisdom in the bible about "there is a time to drink wine, a time to pray, and a time to march." He also criticized that the political reform package is "walking sideways." Also, he brought up the Education Ordinance and Regulations from last year as well as the minimum wages. He pointed out that universal suffrage will deliver more benefits to the citizens. As for many legislators criticizing the Bishop for having been chosen by an "appointment" system, Joseph Zen countered that "the Catholics are least likely to want to be bishops." He pointed out that the Roman Catholic church is a different kind of organization which exists to fulfill the duties given by Jesus Christ; there is no circumstance under which something is voted upon one day and then overthrown the next day. But he emphasized that the Catholic Church is a free organization and its members can withdraw from the church at any time. When the church engages in discussion, there is also a democratic spirit. 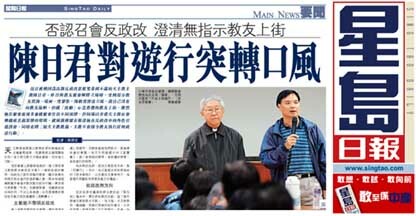 (Sing Tao, print edition) The written statements of Biship Zen distributed at the meeting in St Francis Church. November 26, 2005. Question: "Bishop Joseph Zen call for citizens to oppose the No. 5 Political Reform Report!" Clarification: This is a misunderstanding caused completely by the media. On November 14, Bishop Zen participated in meeting with several religious organizations along with some legislators. Over the next two days, the media reported that "Biship Zen turned around the situation," "Led the opposition against the government" and "Bishop Zen rounds up the votes of the democrats." In truth, Bishop Zen did not call the meeting, as he was just a particpant and did not speak out during the meeting. Question: "Why does Bishop Zen not accept the No. 5 Political Reform Report?" Clarification: Bishop Zen does not believe that the report is bad in itself. Unfortunately, it does not indicate the future for universal suffrage, and therefore ot constitutes a hindrance to universal suffrage. That is why it is described as standing at the same position on the ground. Question: "Bishop Zen instructs the church members to march on December 4!" Clarification: According to the doctrine of the Catholic Church, the Bishop will not instruct the members of the church to take any specific political action. In truth, Bishop Zen has never instructed the church members to march and he has not applied any pressure on anyone. All along, Bishop Zen has advocated: "If citizens wish to express their desere for universal suffrage and hasten the pace of political reform, they can express their wish through demonstrations!" 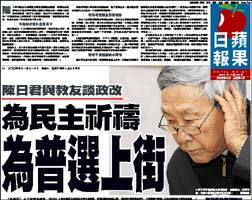 (Apple Daily) November 26, 2005. Last night, Joseph Zen spoke with church members at the St. Francis Church in Shek Kip Mei. He explained his position with respect to opposing the political reform package and the march to fight for universal suffrage. The response at the meeting was quite active, and there were Catholics as well as non-Catholics. The two hundreds seats in the hall were filled up about 15 minutes before the meeting began. The workers had to add more seats for the approximately three hundred church members and citizens. Joseph Zen said: "The Catholic Church is very clear on its teachings with respect to society. Church members should be concerned about society and they have the responsibility to protect human rights and improve the social environment. Therefore, we should join with the citizens to fight for a democratic system." He called for the citizens to join the December 4 march to fight for universal suffrage. He used the passage of the Education Ordinance and Regulations and the denial of the motion for a minimum wage as examples. He explained that a legislature not based elected via universal suffrage cannot take care of the interests of the majority of the people of Hong Kong, and this shows the importance of the democratic system. At the meeting, someone questioned the use of a demonstration march as a means of expression, and thought that praying is better. Bishop Zen quoted the teachings from various popes: "The pope told us to participate in society. We cannot ignore life in this world because we are pursuing life in the next world." Joseph Zen also pointed out: "Everyone has a different time to do different things. There is a time to drink wine. There is a time to sleep. There is a time to pray. There is a time to march." The attendees reacted excitedly to Joseph Zen's words yesterday. Apart from the applause, many attendees also offered pro- and con- opinions and led to a series of interesting questions and answers. One woman used the various social problems in the United States to question whether democratic universal suffrage can solve all the problems. Joseph Zen said that a free and democratic society can also have problems, but the biggest problem faced by the people of Hong Kong is that the government and the legislature excessively protect the interests of the business community and insufficiently represents the interests of the citizens. He said: "I am certain that the Hong Kong under universal suffrage would be better off than now ... It is worthwhile having universal suffrage in Hong Kong. If universal suffrage were here a long time ago, we would have a lot fewer ills." "Actually, I didn't want to call for any march. I said so for July 1 this year. Everybody knows that. But this time, I am concerned. If people want universal suffrage earlier, they'd better come out. Otherwise, the outsiders assume that we don't care about universal suffrage and the people of Hong Kong doesn't care about democracy." Joseph Zen repeatedly said that he is dissatisfied with the No. 5 Report on Political Reform. He said that the Basic Law stipulates that democracy in Hong Kong should proceed gradually, but the current political reform is standing still in the same place. Joseph Zen used hill climbing as illustration. Universal suffrage is like ascending to the peak, but the political reform package for expanding the election committee is like "walking sideways" in the valley and not making any progress towards the peak. With respect to Catholic member Donald Tsang who is the Chief Executive of the Hong Kong SAR, Joseph Zen was sympathetic: "We sympathize with Mr. Tsang, because he has no room to move. We march not to criticize him, but to criticize the political reform proposal. The political reform is like a walk around the garden, and it has no implications for universal suffrage." Joseph Zen's wonderful phrases brought about an atmosphere that was both serious and humorous. Concerning how the pro-Beijing camp criticized the Hong Kong Catholic Diocese for not trusting the central government, he said: "They say that we don't trust the central government. Brother! It is the central government which doesn't trust us." He responded to businessman Gordon Wu describing the protest march to fight for universal suffrage as "mob politics" as follows: "I hope that he repeats that a few more times. It is helpful (to the attendance number)." Many church members declared at the meeting that they will march on December 4 to express their desire for universal suffrage. One young person said, "I am honored to be able to demand justice in Hong Kong as a Catholic." Some other church members said that they support Joseph Zen's continuous high-profile response to the political reform package and believe that this is open and earnest act and there is no need to be concerned about the high profile.